• A steady and stabilized DC regulator circuit that controls direct voltage as required. 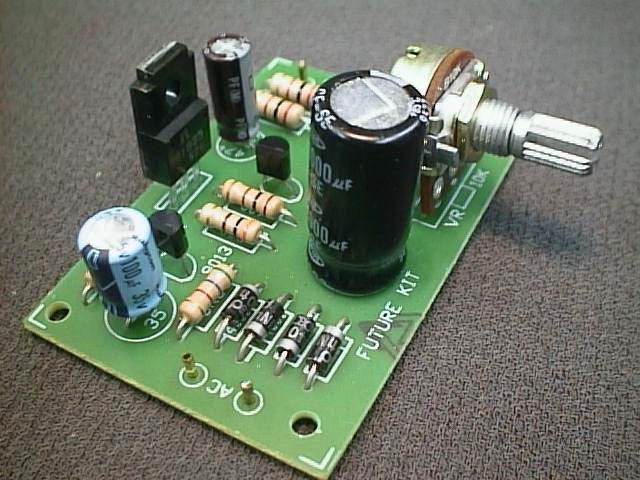 • Having control volume for adjusting output voltage range from 1.5V-30V with max. 1A . • Built-in rectified filter for use when connected to either an AC or DC power source. • PCB dimensions: 2.40 X 1.65 in. Halloween circuits, Timers, Sensors, Motor Controls, Sound Kits, Ghost Busters LEDs, LED Chasers, Voice Controls, Recorders.